Some friends of ours upgraded their old trampoline to a huge model more akin to a helicopter landing pad. Generously, they offered their old trampoline to us, and we didn’t say no! We've placed the trampoline very close to the house and in the shade of some trees so it will be lovely and cool even on hot afternoons. Since we set it up, the girls have been outside jumping on it almost non-stop. 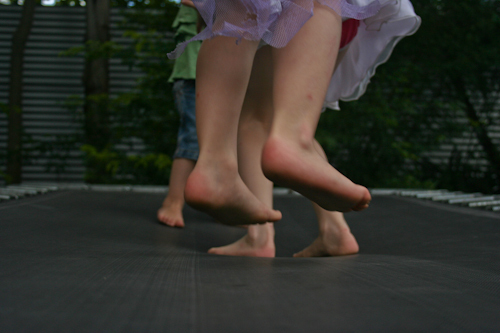 I can see real value in a trampoline (now that we have one) — it lures the kids outside and exhausts them while keeping them happy. 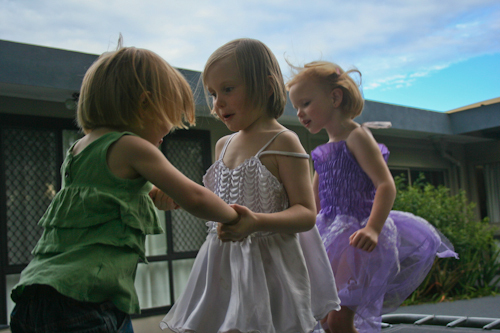 The girls rapidly learned how to jump together so everyone was enjoying the movement. Aisha holds Calista's hands so she doesn't get distressed at the movements. 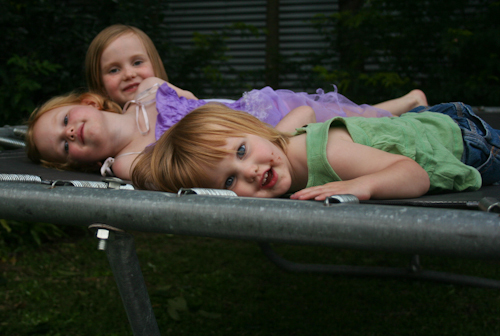 The girls are just loving the trampoline. Thank you so much for your generosity, Anthony and Debbie! 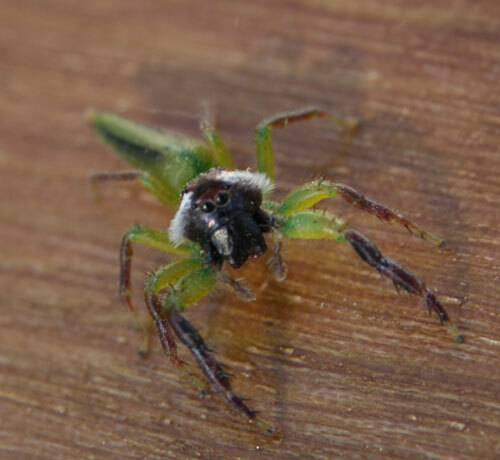 In the video above, the girls only stop jumping to come and investigate the monkey-faced spider (green jumping spider) which is a real beauty. It's easy to see why we call this the monkey spider. It was very difficult to photograph as it jumps around to avoid the camera. Our children love our trampoline too. A lot of people ask me if we are worried about them hurting themselves on it but I think any backyard equipment has the potential for a child to get hurt. It is nearly two years since we got our trampoline and so far no accidents. Well, that didnt take David long to fix up! Looks like the girls are loving it.